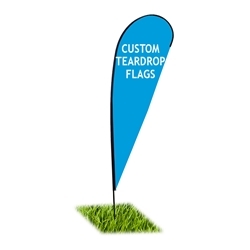 Create your own Teardrop Flag banner with your company logo or advertisement. Email us your high resolution files after you order and we will design your custom teardrop banner. We will email a proof to you in 1 day, so you can see how your custom banner will look. We will make any revisions you may need, until you're happy with the look of your sign. Flag banners provide an easy to see advertisement for permanent use or during any event. The ground stake base is specifically designed for outdoor use, as the spike can be hammered into the ground. "It was easy to place the order on the website and they had the products that we needed!"